But one I know is far more sweet. There are lots and I mean LOTS of times where I’ll envision how something will turn out like oh I don’t know....a recipe, Pinterest DIY, decorating a Christmas Tree and it just looks absolutely nothing like the way it did in my head. Does this happen to you? I like to think it does and we are venting together about our Pinterest fails right now. When I first had the idea of doing wainscoting and a mudroom style entryway I was a little nervous this would have the same outcome. And...... Every once in a while I walk to the front just to look at it because I just can’t belive the picture I had in my head is looking right back at me in real life! These moments are just way too good to not share including a mini DIY! Below is the wainscoting wall DIY for those that are interested, stoppable images of the entryway details, as well as answers to a few questions I've already gotten. I am super lucky when it comes to projects like this around the house because Eric is extremely handy and also enjoys doing it! Below is what we (aka he...I helped paint and hold the level lol) did. Note: I haven't included exact measurements because a lot of it is looking to see what looks best with your space. Our entryway is two stories with a lot of wall space. 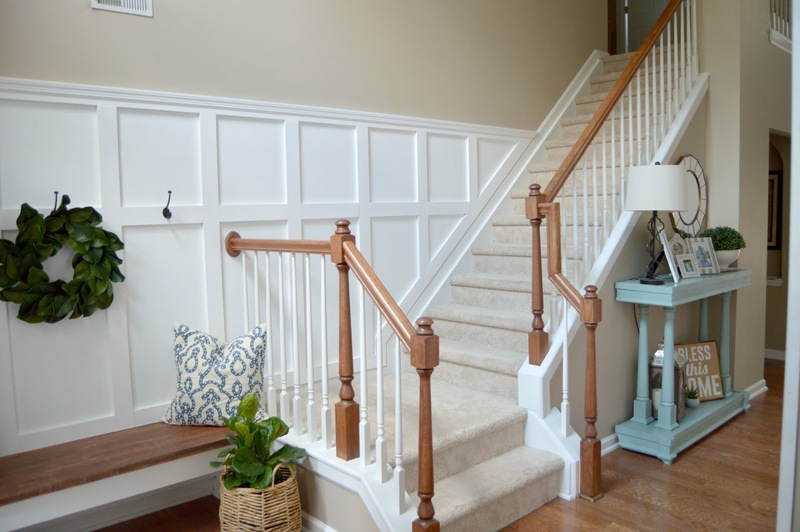 That being said we wanted the wainscoting to compliment that and open up the entryway which is why we brought it up to a total height of 6ft 10inch. 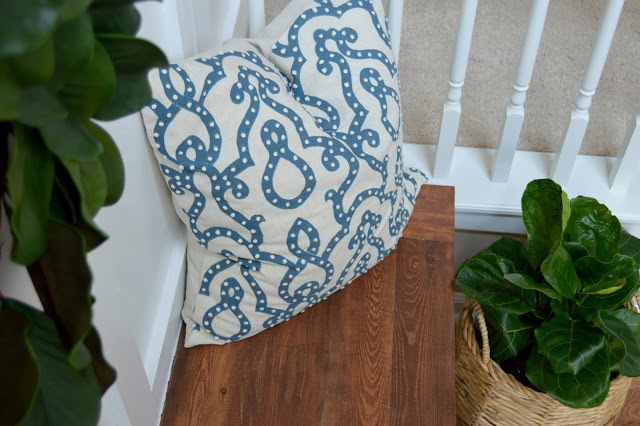 By doing this, we were able to use this as the backdrop for our mudroom style bench as well. 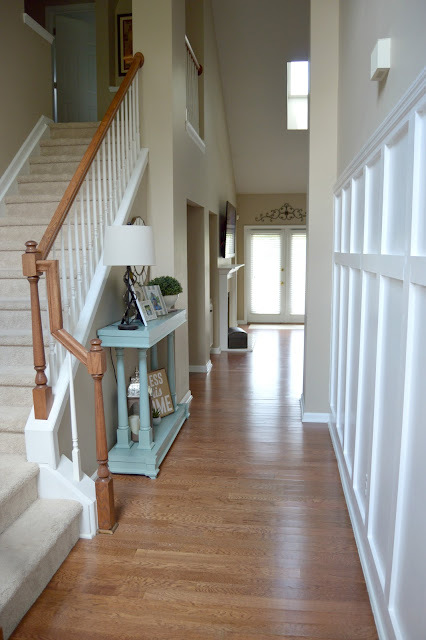 With the goal of wanting to make our narrow entryway feel bigger, I wanted to keep the crisp white color the same as our baseboards. This allowed for it to flow seamlessly into the baseboard of the stairs as it tapered off. It also helped make the bench look like it was meant to be there the whole time. 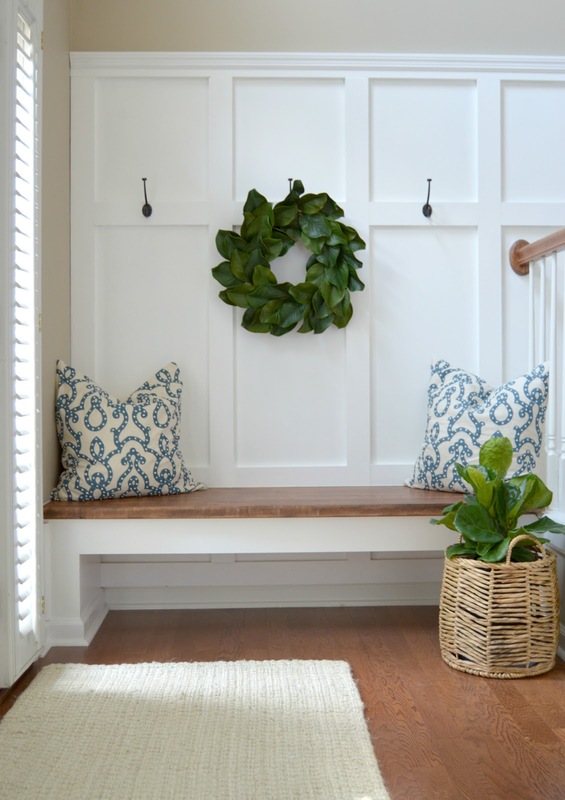 If you notice the base of the bench matches the molding of the baseboard all around. The most important thing when doing this wall is to make sure everything is level and accurately spaced. First measure and lay your horizontal 1x4 Pine base piece. Making sure this is level is key to making sure everything else sits properly. Before nailing the wood into the wall, Eric did a few thin lines of the wood glue to really make sure they were not going to move or flex after being nailed. Make sure you don't do too much glue or it will run and drip underneath. Once the bottom was glued and nailed, we cut one Vertical piece so we could decide how we wanted to space them out. After looking at a few different tutorials, I noticed the spacing typically ranged 15-17.5 inches between each vertical board. 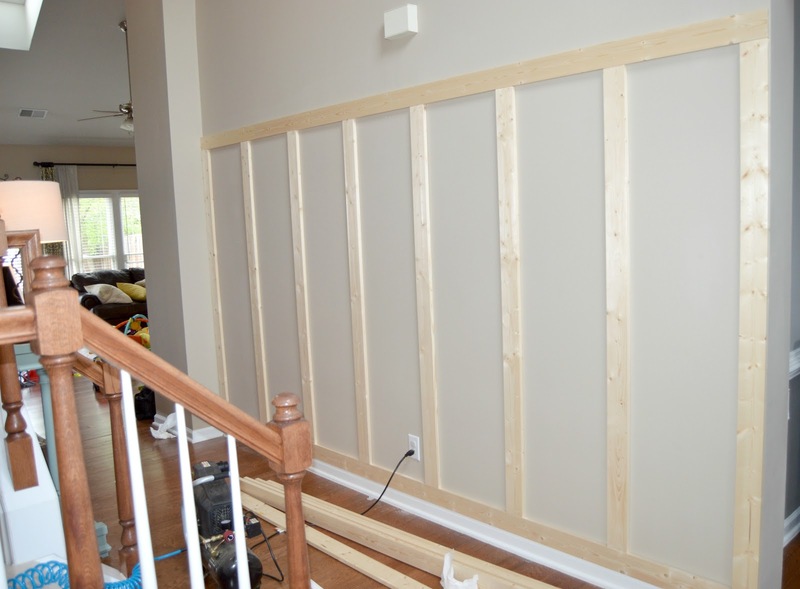 We liked the look of 16 inches but walls aren't perfect so the spacing between each board ranged from 16-18 inches. You can't tell unless you have your measuring tape up. My point of saying this is you have to be flexible and just be willing to work with what you have. This is the reason It's important to measure and place your vertical boards before cutting any of the middle section horizontal boards. They might not all be the same spacing. Are you still with me? 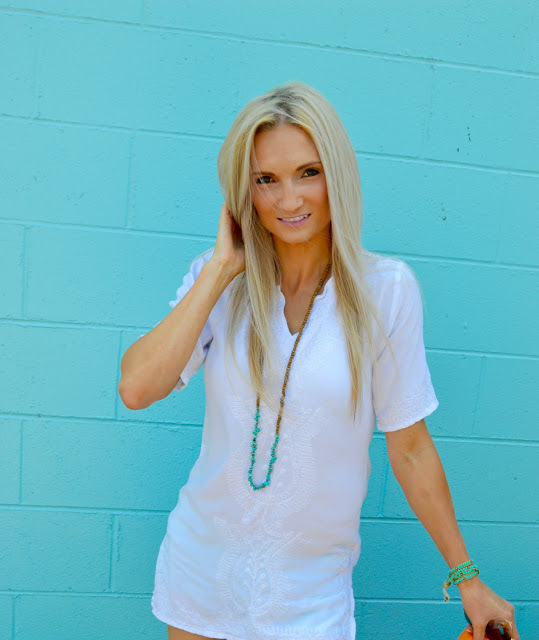 Sometimes explaining things in a blog can be a little more difficult than if we were having a face to face. Once your Vertical boards are glued and nailed to the wall, cut, glue, and nail the top horizontal board followed by the middle pieces. Where to place your middle pieces is totally preference and we liked the idea of a small section up top and a larger rectangle piece below. For reference our top section is 18inches tall and the bottom is 50inches. If you want to finish with a crown piece on the top like we did add that now. It looks great with or without it. We wanted it because it just made the feel of the walls a little more detailed which we both liked. All we did was place the baseboard piece directly on top of the top horizontal piece to be flush. 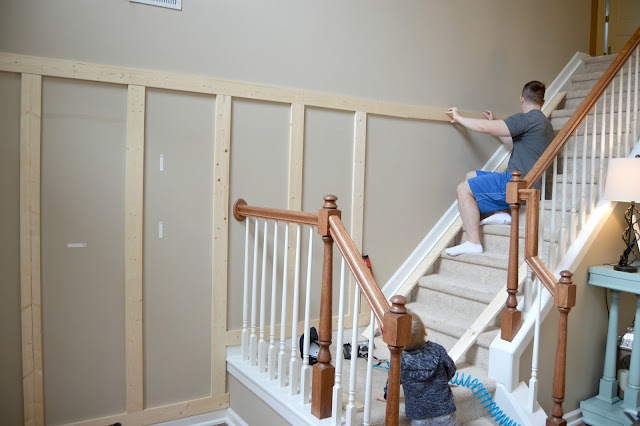 After all the wood has been properly secured to the walls we went over it with spackle to fill all of the nail holes, and any other imperfections of the wood (like knots and divets). Once dried I took a fine grit sandpaper block and sanded the spackle and wood to be smooth to the touch (Including the edges). Vacuum everything up and wipe down with a damp rag to make painting your wall go much smoother. Just for fun... here's a few before pics of what used to be in the entryway. Once sanded and vacuumed, we used caulk sealant on all of the edges so you couldn't see any gaps between the wood and wall after it was painted. For the paint we used a basic Semi-gloss white paint by Behr. Q. Did you use an additional piece of wood between the vertical 1x4 pieces? A. No. The only time I would do that is if you wanted a beadboard backing. If you want a simple look like we did, you would be adding more cost and more work to add extra wood that isn't really necessary. Q. 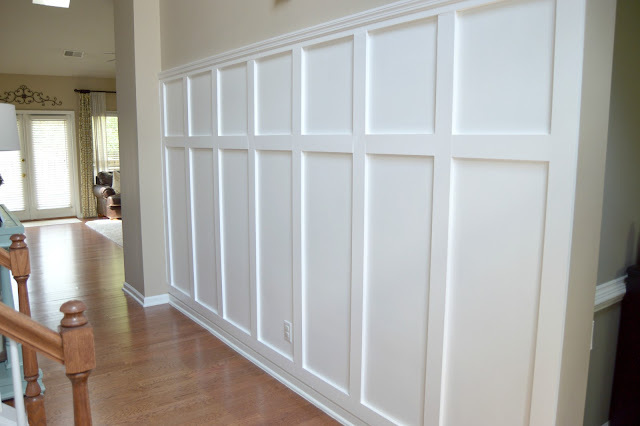 Did you remove the baseboard for the bottom horizontal piece? A. No. 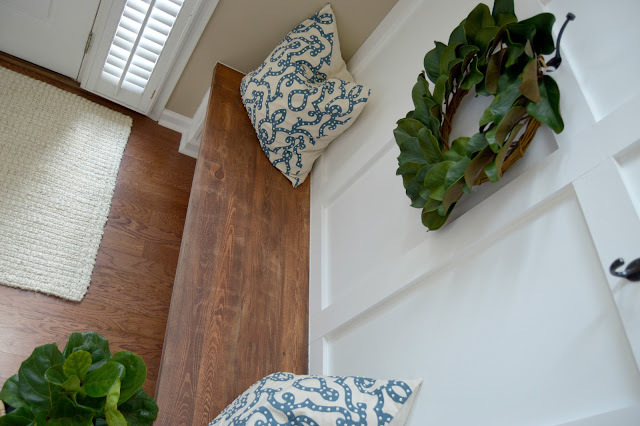 A lot of tutorials did do this step but to be honest (especially since we kept it the same color as the baseboard) it flowed well with the baseboard so there was no point in removing it. We did remove the baseboard where we built in the bench but I'll put those details in that post. If you can think of any questions I didn't answer already, please post them below so I can answer them for everyone else as well! Below are the exact materials we used along with decor options for this project. By clicking and purchasing them online I will receive a small percent and credit for directing you to their site! The majority of items ordered online can be picked up in store. For you this means less time trying to hunt down what you need! Think of grocery pickup and what a gem that's been! It's up front for you to pick up, it makes me happy to know I helped you get what you want, and I get credit for my work! This turned out beautiful! I love it! Thank you so much Paige! That means a lot!! !